Substitute Marcus Maddison delivered a man-of-the-match display for Posh at Chesterfield. Photo: Joe Dent/theposh.com. 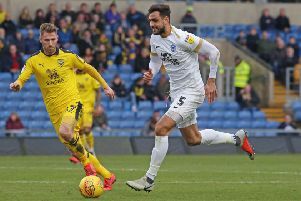 Marcus Maddison’s re-appearance as a first-half substitute was about the only thing worth cheering as Peterborough United slumped to a 3-2 League One defeat at Chesterfield yesterday (December 26).